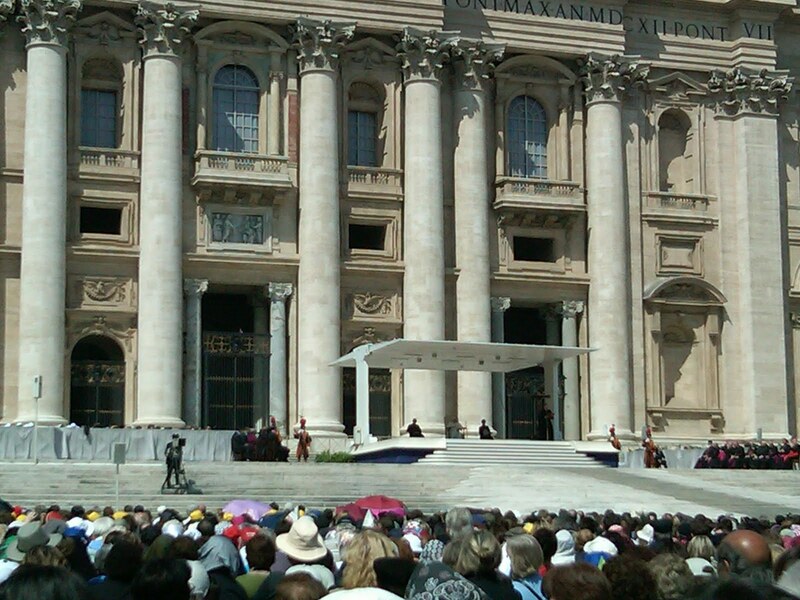 Every Sunday, thousands of people gather in St. Peter’s Square. Their faces are filled with anticipation, excitement, and joy. More often than not, a vibrant band is playing music and drums are thumping to various beats. Banners are waving, flags are unfurled. Dispersed throughout the square are numerous wildly attired groups practicing chants. Laypeople, priests, religious, random tourists, souvenir hawkers, roving journalists-all of them are making their preparations, glancing furtively up into the air, hoping to see a flash of white pass in the miniscule blackness that has opened its windows to the world. The anticipation builds; one can sense that the crowd is about to erupt. Suddenly, there is movement in the window; a curtain is rustled, and all at once the deafening roar of a delighted people can be heard throughout Rome, for our Holy Father has just appeared to lead the faithful in prayer. I know it sounds a bit absurd, but the moment you first spot that flash of white in the window, it’s as if all of your worries disappear. Even the most skeptical and reluctant among those assembled find themselves thunderously clapping and shouting, tears in their eyes. He is surprisingly far away; his body barely filling a quarter of the enormous frame. He is nothing more than a white dot in the window, but he is our Holy Father, the Successor of St. Peter, the Vicar of Christ, and the leader of the Universal Church. And he is right there! The first time I saw the Pope was in 2000 at a Wednesday Audience. I was in Rome as a tourist, before I had “reverted” to actually live my Catholic faith. Despite my practical agnosticism, I desperately wanted to see the Pope. So we went very early, and we fought for wonderful seats: the first row in the square. We were completely surrounded by Polish nuns who evidently were in fits of ecstasy just thinking of seeing Pope John Paul II. I could appreciate the importance of this opportunity for these 200 women; what I did not anticipate was the magnitude of their reaction. As the Pope turned a corner in the square and drove up the center aisle, I was literally crushed against the railing by screaming religious. As the Popemobile grew closer, I lost my footing and slipped to the ground. Moments later, I was being trampled by elated nuns! As the Popemobile passed, they began singing, and one of the shorter ones decided to use my head as a footstool. Fortunately for them, but unfortunately for my head, the Pope stopped to listen to what must have been for him an absolutely heartwarming Polish tune. I admit, even from my decidedly more terrestrial position, the song sounded nice. The Pope moved on, and I recovered from the cobblestones while the giggling gaggle of nuns rejoiced, oblivious to my just-ended plight. I should have been upset. But you know what? I got to see the Pope’s foot up close, and I was so excited that my vengeful thoughts vaporized. Plus, I did get an excellent picture of half of my face and my arm desperately flailing under the stampede with the Pope waving. I was in a picture with the Pope! Sort of. Why is it that we go nuts when we meet the Holy Father? Millions of people each year come to see the Pope. People all over the world who have had the incredible opportunity to touch him or kiss his ring proudly display the pictures in their homes and offices. Why is this? What is his draw? I have asked myself this question endlessly, and the only response I have is supernatural. We don’t go gaga for Cardinals or Monsignors; it’s just the Pope that gets this treatment. The simple fact is, he is the representative of Christ on Earth-his Vicar, and head of the Church. With such a position comes a grace to which we are attracted. The Holy Father stands as the representative of a two-millennium tradition. He stands as St. Peter, the keeper of the keys even today. The Pope is tangible evidence of the ongoing intervention of God in the world. On the front façade of the Basilica of St. Peter, there is a sculpture of Jesus giving the keys of the kingdom of heaven to Peter. Just under that relief, on the main door to the Basilica, there is another of Peter handing the keys to one of his successors. The Pope is one of the visible signs-perhaps the most recognizable in the world-that our Lord will never abandon the Church: “You are Peter, and on this rock I will build my Church, and the gates of hell will not prevail against it” (Mt 16:18). The power entrusted to Peter by Jesus Christ has been faithfully transmitted through the Catholic Church for 2000 years. Just as our faith has been preserved and passed on to us by our parents and their parents, the authority of Peter has been preserved and transmitted through the succession of Popes. For as long as this world endures, the Catholic Church will be led by the successor of St. Peter, who leads us nowhere if not to heaven. When the little white dot appears in the window, no matter how many times I have seen him, my eyes moisten, because I am looking at the man chosen by Christ to lead me to heaven, the man who shepherds my soul and who wants me to know and to love Jesus Christ, the man who suffers human failings like the rest of us but wears the white glory of having been chosen by Christ. Our Holy Father goes this week to the Holy Land. Please remember to pray for him, for his mission, for his holiness, and for his health. I sincerely hope that you get to see that little white dot in the window someday. Long live the Pope, and God bless the Church! Amazing how one city can offer so much and attract so many different people from all over the world! From ancient Roman history to the Vicar of Christ ‘ the Pope! People come as tourists, pilgrims, history and art students and just for the romanticism this city offers! Our pilgrim group is enjoying the 4 Patriarchal Basilicas – by visiting them, praying and walking through the history of the Church! Water fountains in middle of plazas, Italians’ warm hospitality, sidewalk cafe’s serving pasta, cappuchino, wine…people greeting each other in the streets “caio!” and gelato stands along the streets – it all makes this city not only a city of marvelous sights and sounds, but of a great joy! the pilgrim group will attend the General Audience with Pope Benedict XVI and then visit the Vatican’s museum. Ending the day with Mass at the Pontifical North American College! The delicious pizzas and variety of pastas have been a part of our daily menu! Don’t mind at all since we are walking so much each day! Numerous gardens have statues of Saint Francis; either holding a dove or by a water fountain. Meeting the man who was once called “king of the party” in Assisi by his friends who also came from wealthy families…a young man who disrobed in front of his father, and the public in the center of Assisi to renounce everything in the world in order to follow Christ…this man is the REAL St. Francis! Ah yes, he wrote about and to the Creation of the world – calling the Sun, Brother Sun and the moon, Sister Moon and preaching to the birds, the animals. Walking througbh the cobblestone streets of Assisi is like walking in the footsteps of this unique young man who lived in the 12th century. The pilgrim group was introduced to this man, Francis by an American who lives in Assisi as a third order member of the Franciscan Religious community. 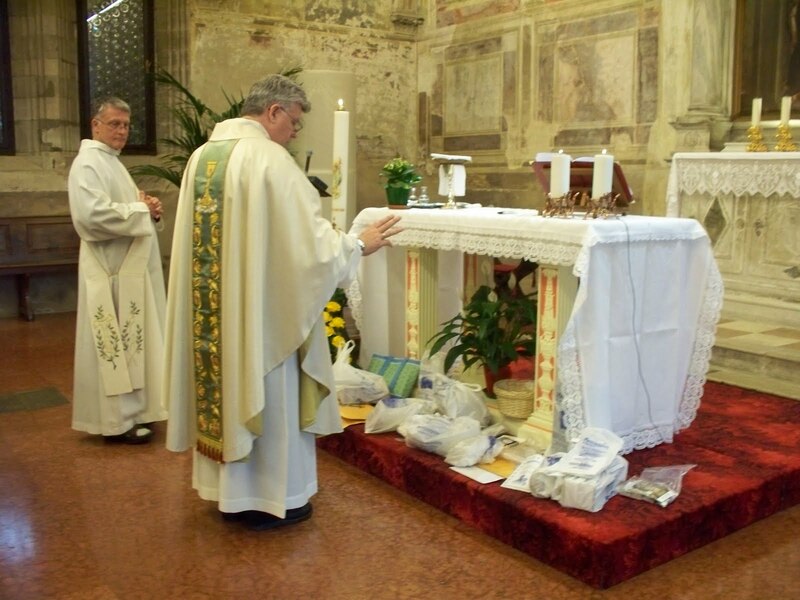 His Ministry to introduce Francis to pilgrims, to visitors by giving them a tour of the Basilica of St. Francis where the Saint’s body is entombed, frescoes dating to thee 12th century and his relics. Francis came alive for us! It was now someone we wanted to learn more about…Francis – a man of peace, a man loved by all peoples. His friend, St. Clare’s body is found incorrupt today. Only Catholics get excited about incorrupt ‘bodies’ of holy men and women! Clare and Francis….help us to appreciate the moon, the sun, the birds…life! Venice has been in stories, art, movies and expressed by so many as the city on water! We like to say it is the city of Saint Mark the Evangelist; whose remains are entombed in the Basilica of St. Mark. We had Mass today in a Chapel dedicated to the Virgin Mary. The Tovars, parishioners of St. Mark Parish in San Antonio were elated that this chapel was located next to the Tomb of St. Mark. Byzantine mosaics lined most of the walls and ceiling. 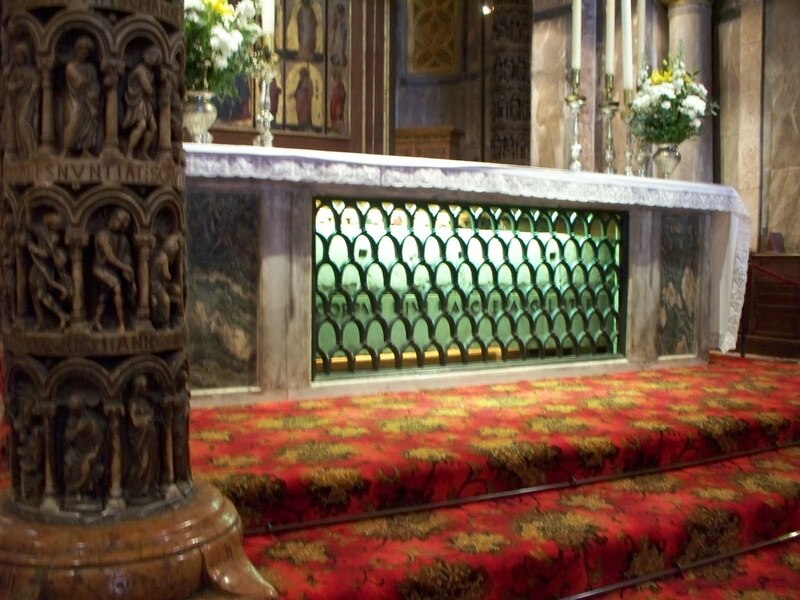 How would you like to find yourself kneeling in front of St.Anthony’s Tomb? Did you know that the famous St. Anthony of Padua was one of the most famous Saints in the Catholic Church? Today, our pilgrim group spent time in the Basilica of St. Anthony in Padua, Italy…We saw his tunic and yes, only Catholics get excited about these kind of things – his incorrupt tongue and vocal cords! They are kept in a reliquary in a nearby chapel with relics from Franciscan Friars. Cobblestone streets, gelato stands, ancient buildings, plazas with pigeons and street vendors reminiscent of Fiesta in San Antonio! What a day…as my friends sit next to me eating a gelato – what flavor? Try Lemon and strawberry! 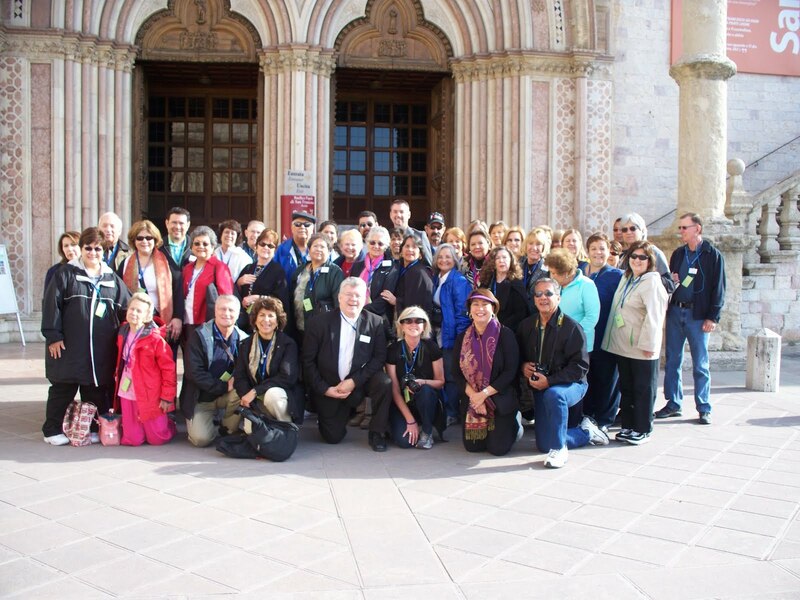 Our pilgrim group’s first few hours on pilgrimage began in the city of the Holy Shroud – Turin, Italy! Upon arrival on April 14 – we followed the Holy Shroud one mile trail to the Cathedral of the Turin where the Holy Shroud is on display. Tired from the 30 hour journey from Texas to Turin, we anticipated this moment after waiting months and for some, years for this moment! Upon arrival, we were allowed some time in front of the Holy Shroud; it was as if time stood still! There was silence and a peace viewing this authentic relic of the cloth that covered our Lord’s crucified body. Oh how Jesus suffered…seeing the wounds, the blood stains, the marks from the scourging! Today, April 15 – we awoke early to walk to the Cathedral arriving at 6:45am for a 7am scheduled Mass at the foot of the Holy Shroud. The Mass was in Italian with 10 priests; Fr. Joseph Mary Marshall was among them. One pilgrim from our group experienced a physical healing during Mass! After Mass, we spent 45 minutes in silent prayer before the Shroud. Imagine, receiving the Body and Blood Christ in Mass; and spending time in communion with Him in front of the cloth that covered His crucified body! Afterwards, we spent time in the Eucharistic Adoration Chapel…then returned to our hotel for breakfast. Later we visited the Holy Shroud Museum. A most unique and extraordinary day; with free time to enjoy this beautiful, historical city of Turin! Tomorrow – the city of St. Anthony – PADUA, ITALY! Follow along with each weekly episode by visiting the blog or our website before the show airs. In Episode 3 of our series, Dr. Delaney and Alan Becker explore creation and the Fall and what this means for our personal experience of goodness and of sin. Our hosts look at how the Fall affects our relationship with God and with others, and what the challenges are for having a fully Christian life of joy. Why would God create a world in which there is pain, suffering and death? Why am I drawn to things that are not good for me? What is the difference between pleasure and joy? Do men and women experience temptations in the same way? Bernadette Soubirous, virgin and visionary of Our Lady of Lourdes. Learn more about St. Bernadette here. Anastasia Northrop’s “The Freedom of the Gift: A Study Guide for JPII’s Theology of the Body.” Look for this study guide in your local Catholic bookstore, or you may purchase it online here. Whom do you think Jesus would first appear to? WHY did the eleven not beleive when told that the Lord had risen? Was it because of their guilt, that theyhad abandoned him? Guilt can rob us of our faith and prevent us from experiencing the love and mercy of God. That is why forgiveness is essential. In the Sacrament of Confession, Jesus forgives us and gives us the grace to forgive ourselves and others. We thank the Lord for this gift of Confession/Penance – not only do we encounter the Lord Jesus in this Sacrament through His promise…we have received much peace! Has it been a long time for you? Don’t wait any longer! Afraid? Do not be afraid! Tell the priest it’s a been long time and he will help you along. Alleluia! Christ Jesus is Risen! May you experience the peace and joy of Jesus, who died and suffered for us and rose from the dead. The Church celebrates the Easter Season for 50 days; what a glorious Liturgical Season to “see and believe” and to celebrate the Resurrection and new life in Christ! Let us live this Easter Season in hope and in prayer for those who have not yet encountered the Risen Lord! This photo is of the Tomb of our Lord. 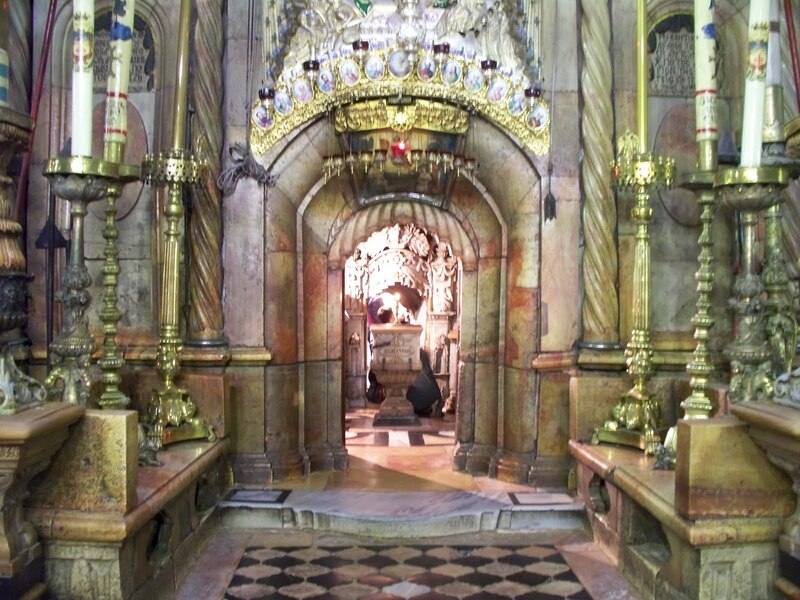 The Basilica of the Holy Sepulcher in Jerusalem is built over the Tomb & Calvary. Notice the marble step as you enter – it is so worn by the millions of pilgrims who have entered and venerated the Tomb of our Lord! Our pilgrim groups have Mass in the Tomb when we lead pilgrimages to the Holy Land. 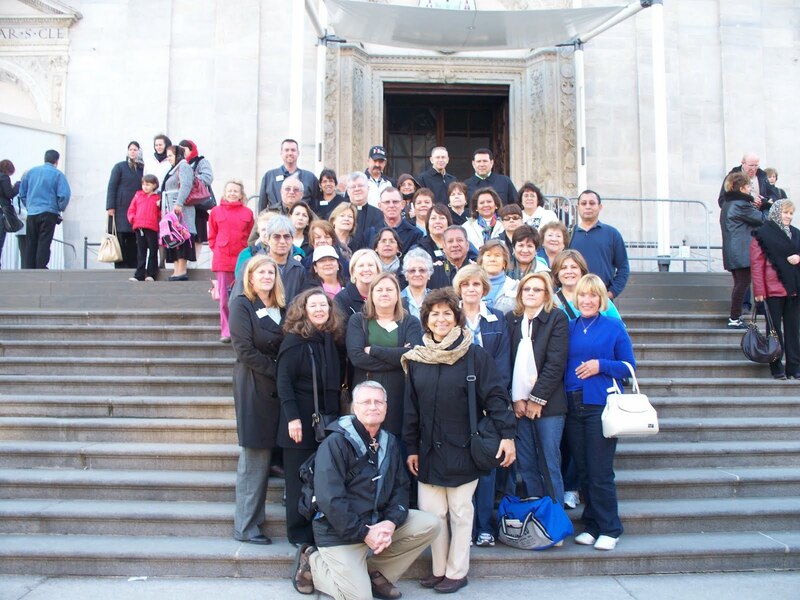 Join us on a pilgrimage to the Holy Land October 27th, 2010. Come and See! 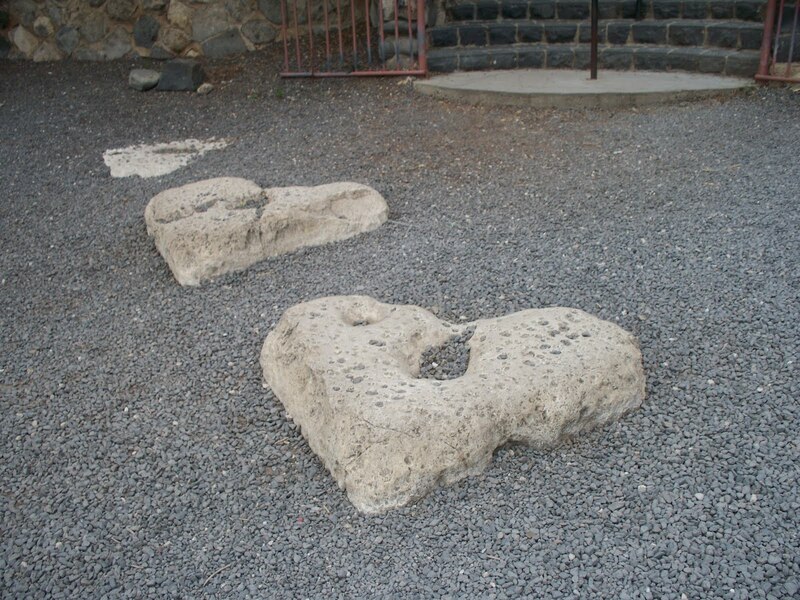 Come and venerate the Tomb of our Lord, and see where He lived, taught, healed and where the Church began!